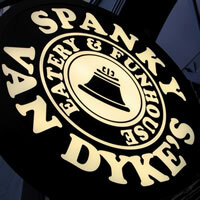 The brilliantly-named Spanky van Dyke’s is more commonly known in Nottingham as a student haunt, selling good beers, excellent food and pushing home their motto of ‘Eatery and Funhouse’ to the max. Now, though, in a cunning bid to establish themselves on the city’s vibrant music scene, they’ve started to attract some top-drawer acts. Razorlight frontman Johnny Borrell popped by in September 2013 to showcase his solo work, while Spector – London’s finest purveyors of slender-pop – played to a sell-out crowd in October 2013. Those two gigs raised the bar for the venue, and with drinks served in actual glassware at very reasonable prices (compared to their city counterparts), not to mention some interesting decor, this place – although not new to hosting gigs, albeit small, local acts – could become a welcome addition to Nottingham’s myriad music venues.